An evergreen, large flowered hybrid rhododendron bush. 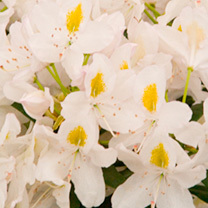 It produces big trusses of stunning large white blooms. Flowers April-May. Height 150-180cm. Supplied in a 4 litre pot.